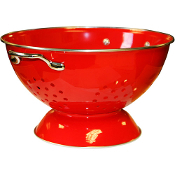 Calypso Basics 5 Quart Colander Multiple Colors // Note: Thumbnail on last page denotes the Red color. 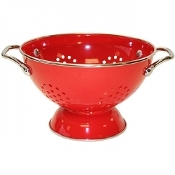 This 5qt colander is powder coated colored finish with stainless steel rim and chrome plated handles. Great... 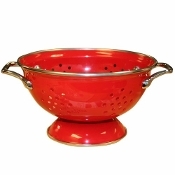 This Orka 3 quart Colander was designed to strain large quantity of vegetables and starchy foods. Its rigid handles offer easy handling and a smooth transition from the sink to the work-top.